Pedal boasts unique separate Level control for beat-split delay repeats. 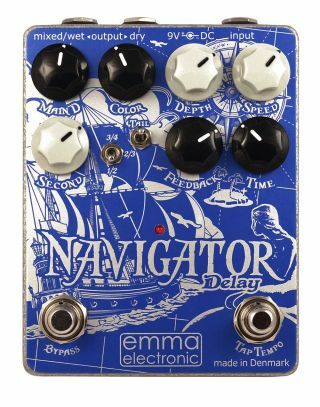 EMMA Electronic has introduced the ND-1 Navigator delay, which combines analog and digital technology in a compact pedal to generate classic tones as well as unique new sounds. In addition to tap-tempo, modulation, beat-splits, trails and wet/dry outputs, the ND-1 boasts a unique separate Level control for beat-split delay repeats. This option allows the user to emphasize the second delay voice, or to turn the main delay off entirely to create interesting new rhythmic delay effects. The ND-1 is currently being offered for $279. For more information and to purchase head over to Godlyke.com.